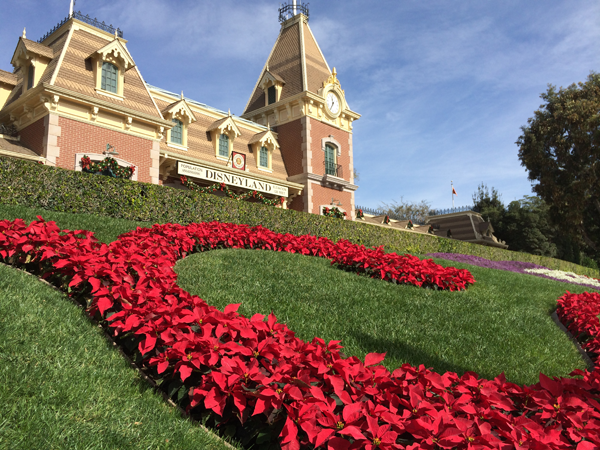 This November, I was traveling solo for work, and had one day to spend at the Disneyland Resort in Anaheim, California. 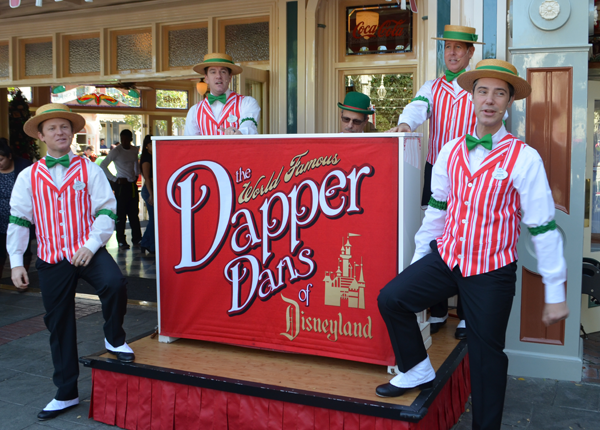 Of course you can have fun at the Happiest Place on Earth on your own, but isn’t it always more fun to share the experience? 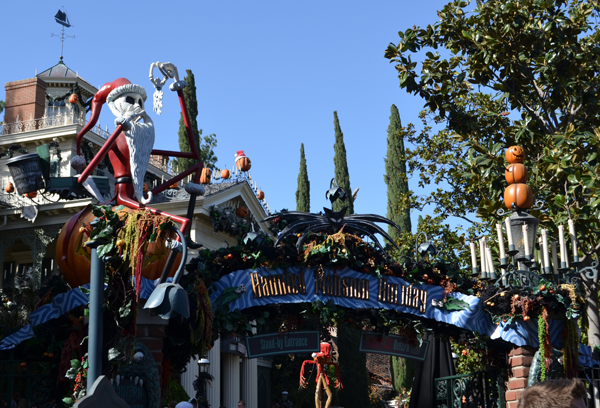 Fortunately, my good friends Sarah and Richard Woloski of Skywalking Through Neverland live just down the road, and offered a personal tour of the parks all decked out in the holiday finery. 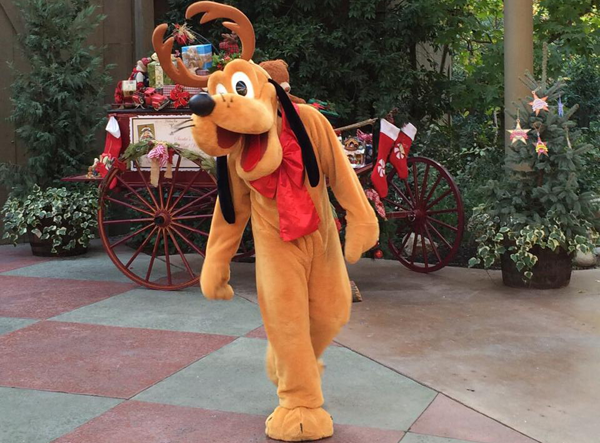 So follow along on as we Skywalk through Disneyland for the holidays. 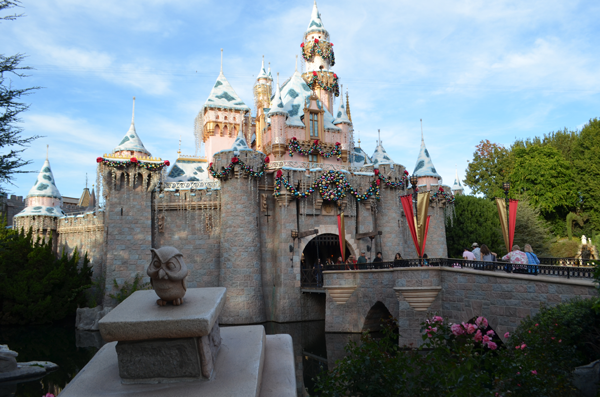 Now, I had not personally visited the Disneyland since 2011, and never during the holidays (well, not since December, 1980, but that’s a story for another time). 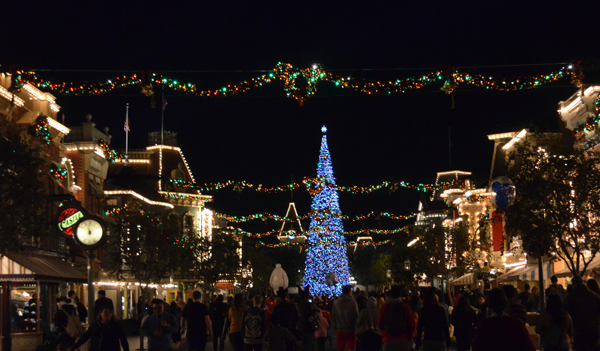 So I was excited to see the new additions over the last three years, and the special things Disneyland does to “just get merrier” for Christmas. Many of these things we’ve covered previously in more details on the site, and I’ll add links as we go along. 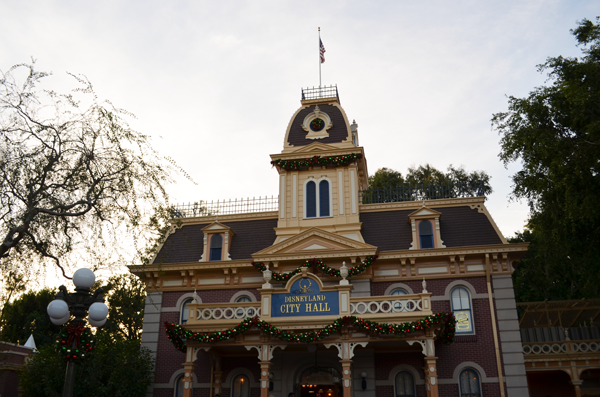 So consider this a photo-blog chronicling our day Skywalking through the parks. 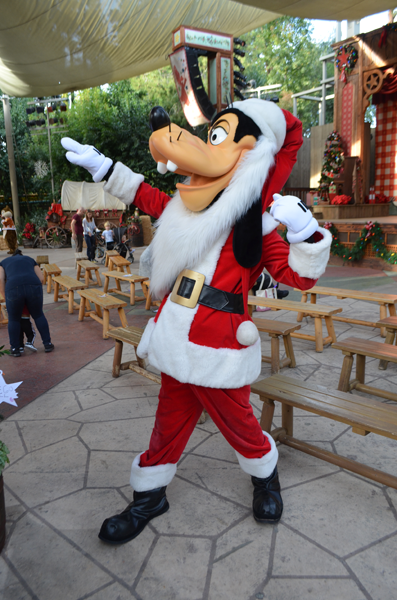 And what a beautiful day it was! 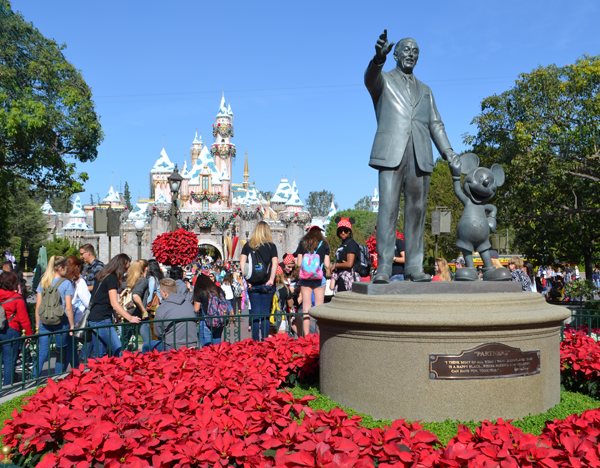 As western New York dug its way out of the seven feet of snow that buried Buffalo, Southern California enjoyed another sunny, 70 degree day with blue skies and no humidity. 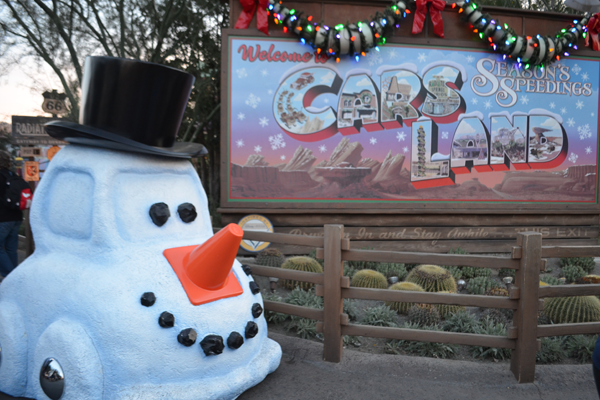 Remind me why exactly we live in the snow belt again? 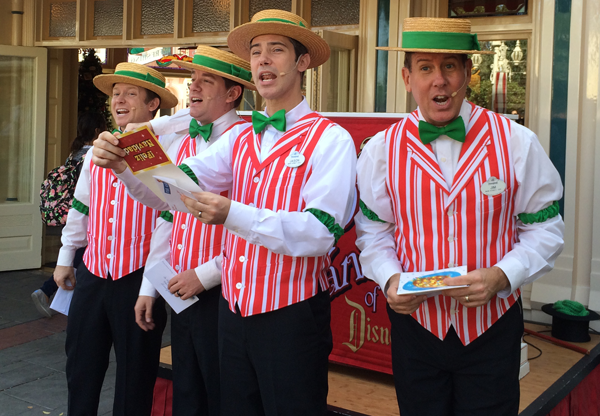 As we Skywalked down Main Street, U.S.A., the Dapper Dans had just started their holiday set on Casey’s Corner singing Christmas Carols inspired by the cards they’ve received. 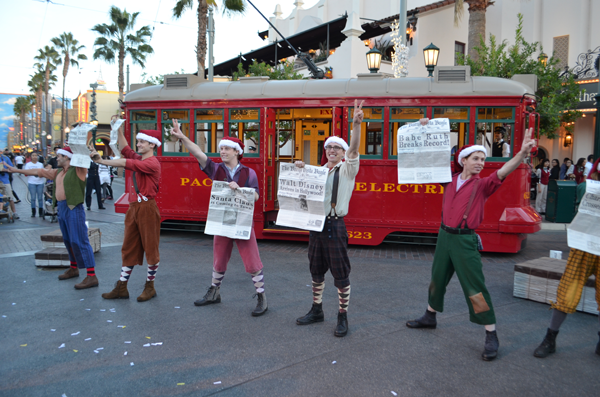 And, how convenient, they had the cards right there! 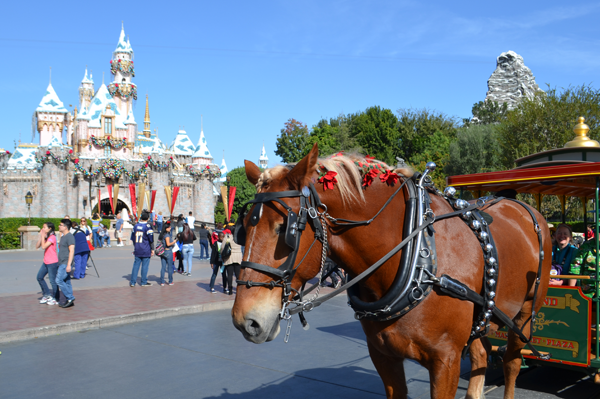 Continuing on, the Partners Statue in the hub and Sleeping Beauty’s Castle looked splendid draped in festive greenery, and I was particularly thankful for the bow-dangled horse that stopped in-frame as I composed my shot. 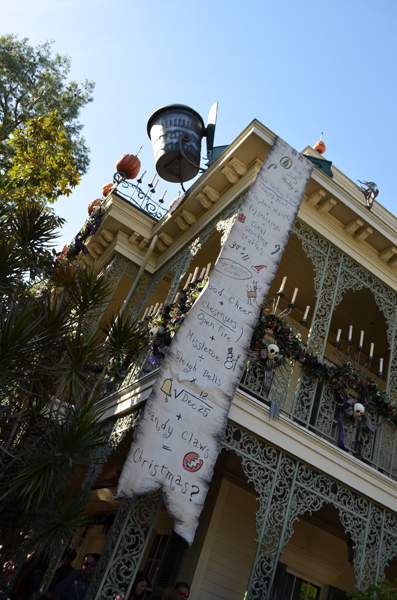 For years I’ve heard praises of the Nightmare Before Christmas overlay to the Haunted Mansion transforming it into Haunted Mansion Holiday. I couldn’t wait to see what the fuss was about, and with as many articles and photos that I’ve read, I was STILL surprised with how extensive a mash-up it was. 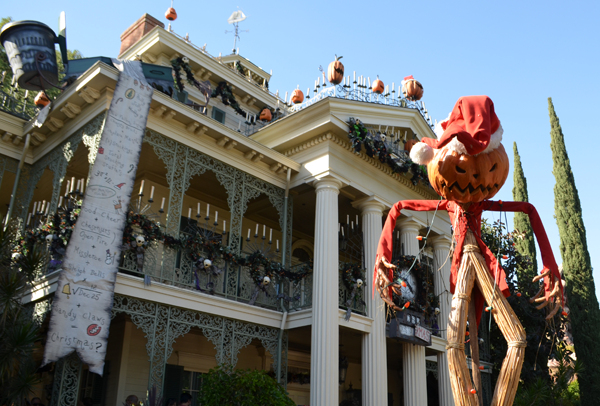 I expected Jack Skellington, Zero, and friends sprinkled throughout the attraction, but was taken aback with all the added effects and story that went into Haunted Mansion Holiday. So well done! 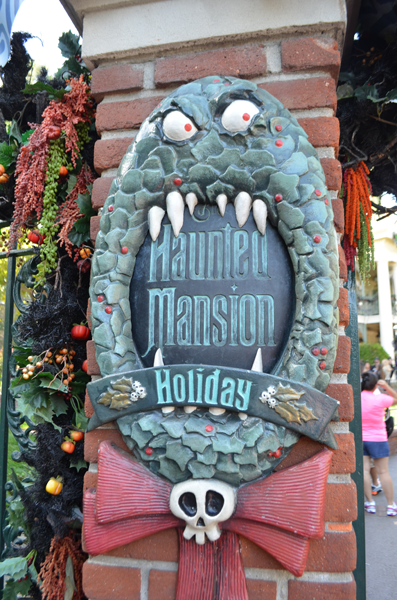 You can learn more about the history and story of Haunted Mansion Holiday on Episode 57 (background) and Episode 58 (ride through) of Skywalking Through Neverland’s with their Ghost Host Dave Skale (who would join our Skywalking party later that evening). 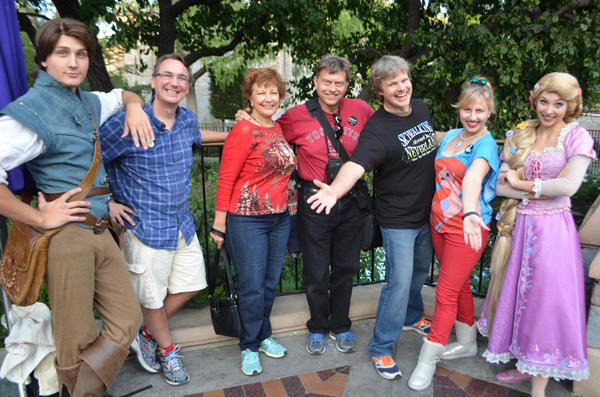 Afterwards, we grabbed a little lunch at the Hungry Bear, and sat a spell by the water’s edge at the Rivers of America. 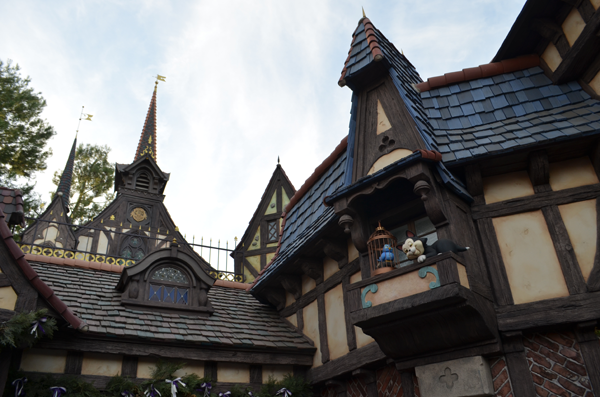 I can still remember riding the Sailing Ship Columbia during my first visit to Disneyland in 1980. 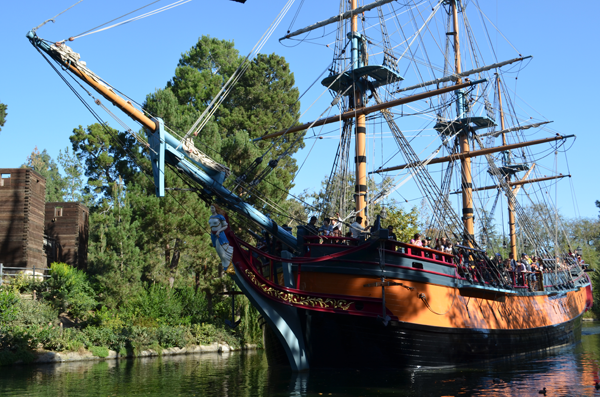 From sailing ships to a Jungle Cruise, there’s plenty of boats to enjoy at Disneyland. 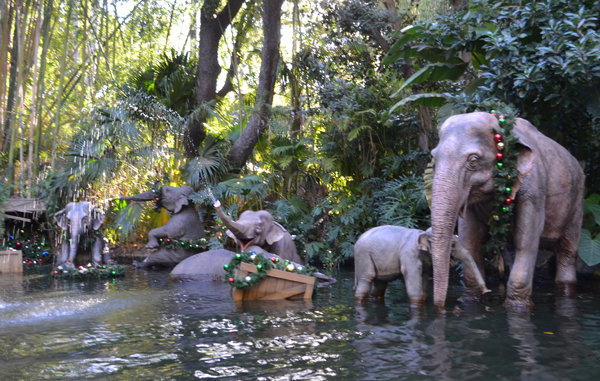 For the Yuletide season, Jungle Cruise turns into Jingle Cruise – a cute new take on the venerable classic. 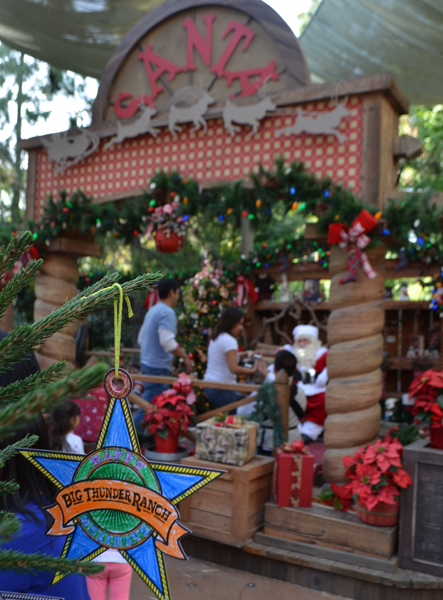 The story goes that the shipment of Christmas decorations were “lost” in the jungle, and the jungle residents decorated the jungle interior, classic jokes are updated with holiday embellishments too. 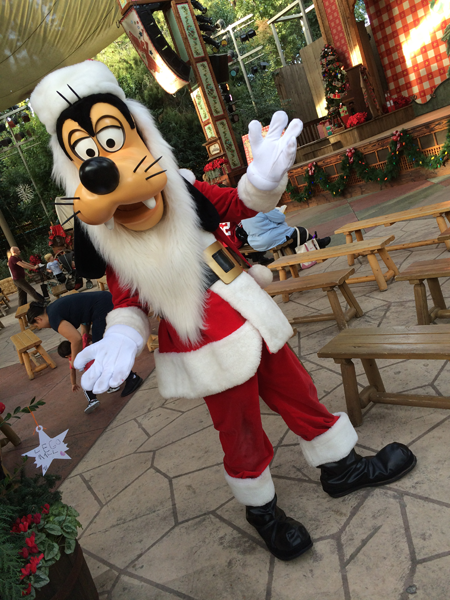 Follow the link to take a full VIDEO ride on Walt Disney World’s version of Jingle Cruise. 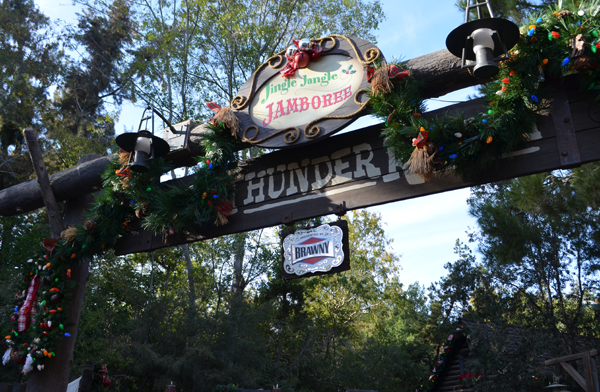 Next, Sarah Skywalked us over to Big Thunder Ranch and the Jingle Jangle Jamboree for snacks, crafts, and goofin’ around with Santa and the Disney characters. 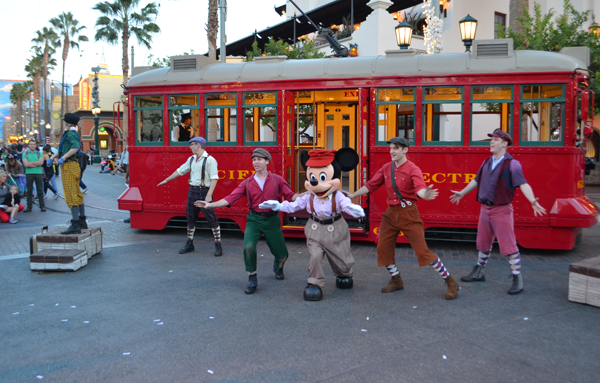 A once stop shop for Santa Claus, Mickey, Minnie, and pals, holiday games, treats and an old-timey melodrama to boot. 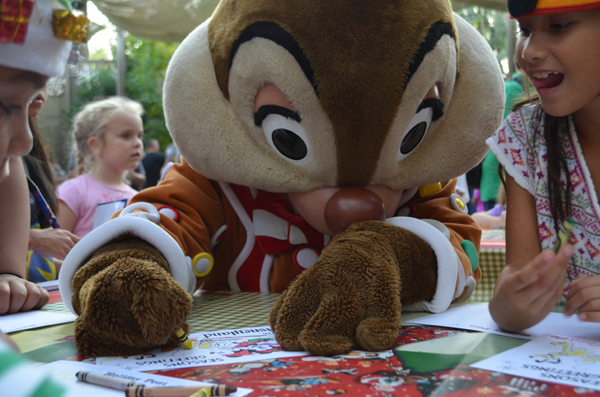 I loved the holiday outfits for the characters, and how Dale even joined in with the crafting fun. 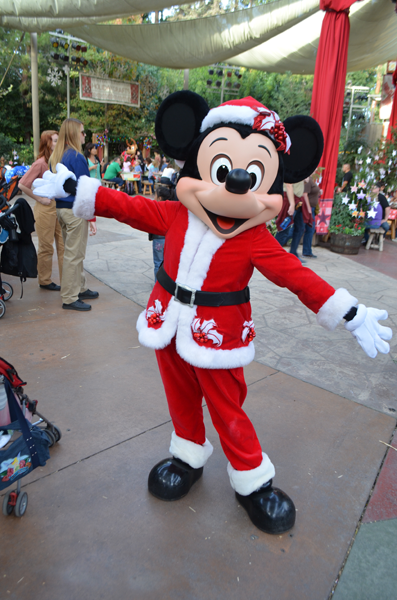 Isn’t Mickey’s Christmas suit fabulous? 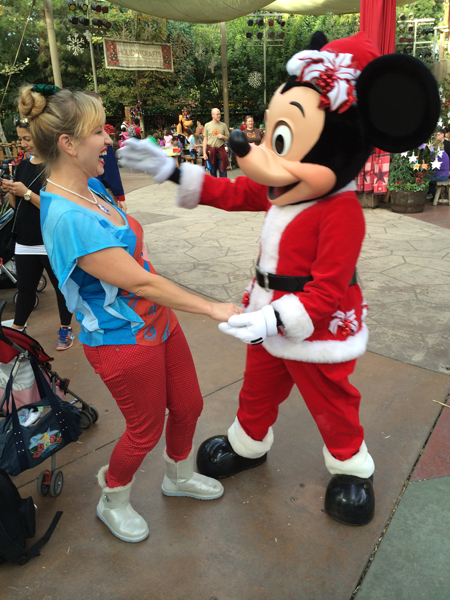 I bet Minnie picked it out. 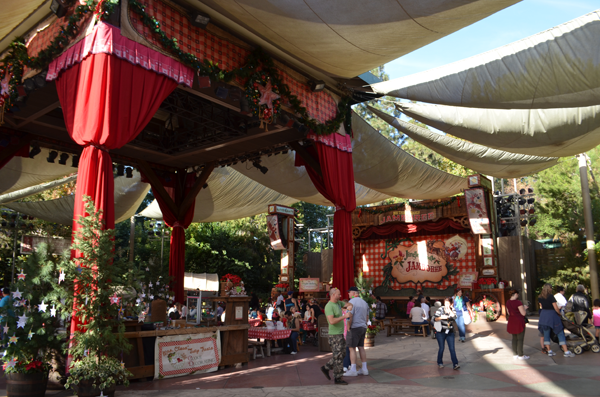 From the Fab 5 to Fantasy Faire – the princess meet and greet location opened in March, 2013 (follow this link for Chrysty Summer’s full recap review) replacing the historic Carnation Plaza Gardens. 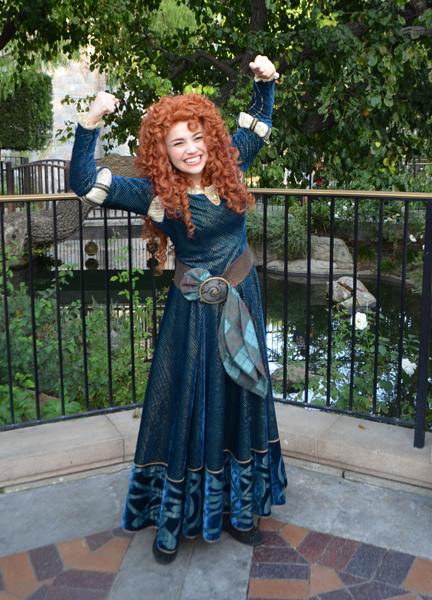 Here we found Merida along with Flynn and Rapunzel waiting to meet us. 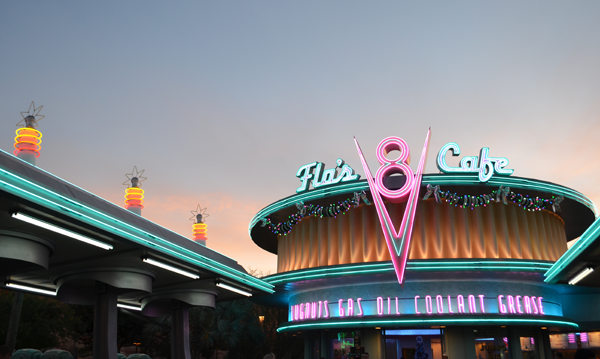 However, the ONE thing I most wanted to see during this visit was Cars Land at Disney California Adventure. 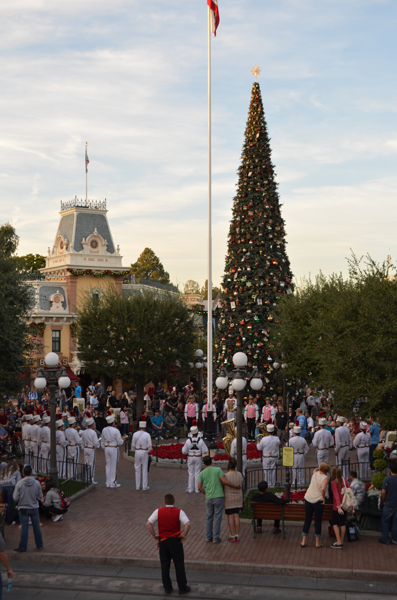 So just before the sun went down we made our way out of Disneyland, catching the flag retreat ceremony along the way, across the Esplanade, to the other theme park. 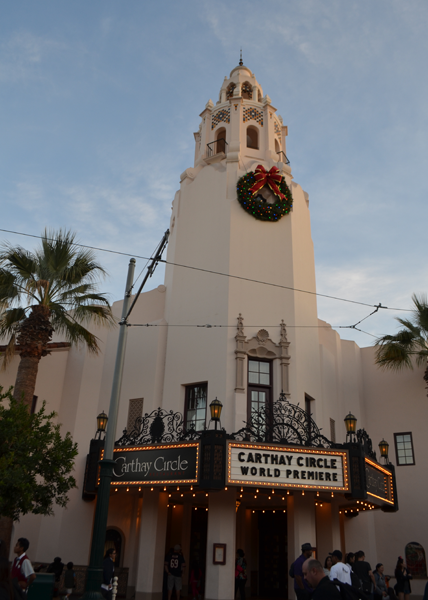 Entering Disney California Adventure I came face-to-face with their new icon the Carthay Circle Theater on Buena Vista Street. 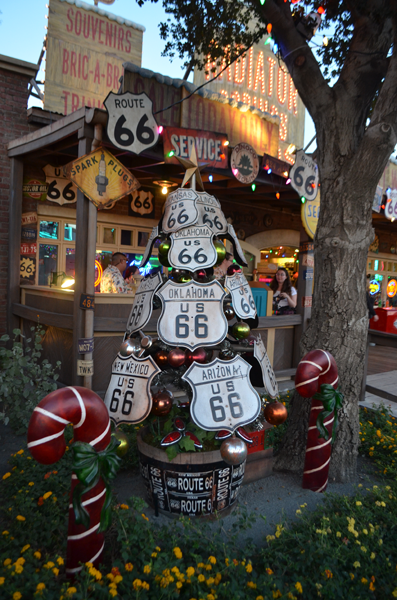 Chrysty Summers has detailed the street (as well as their holiday decor) previously in this link. 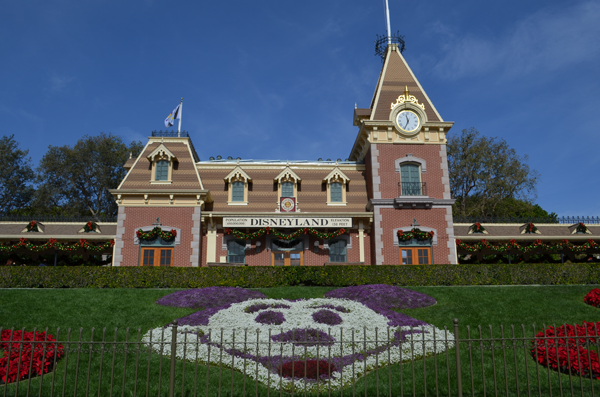 At this point in the tour, I’m thoroughly convinced that the ONLY way to visit the parks is with a Skywalking Through Neverland tour. 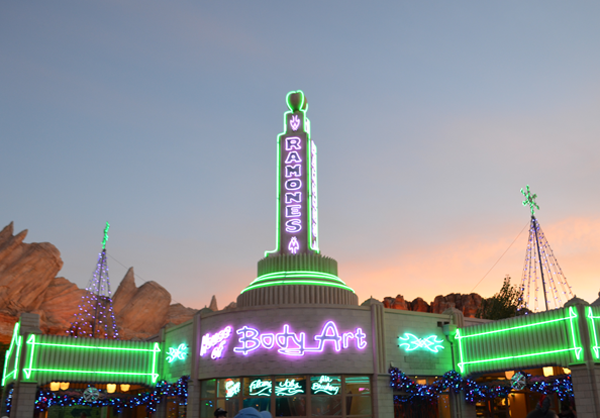 Sarah arranged for us to arrive at Cars Land just as the sun was setting and neon lights flicked on right down Route 66. 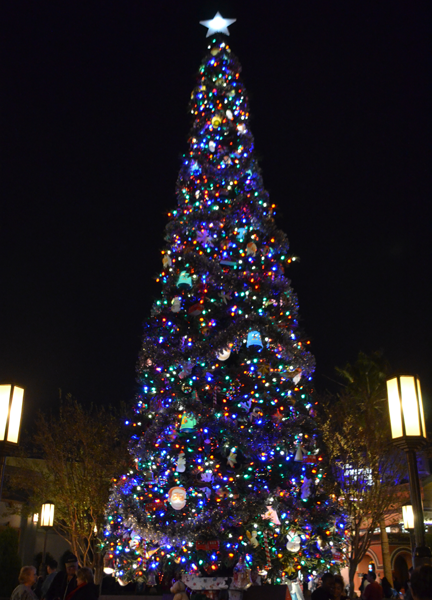 Simply gorgeous… thanks for arranging that Sarah. 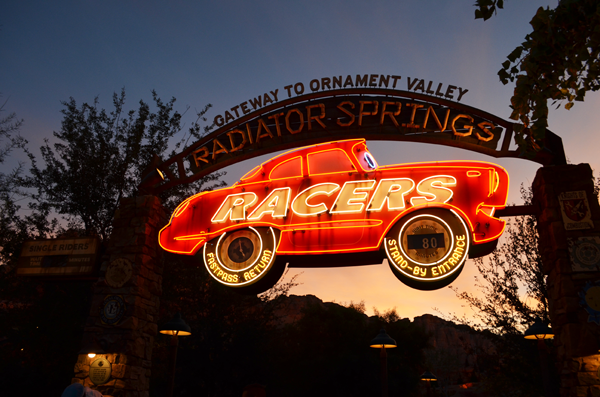 A mere two and a half years after opening, I finally took my first spin on Radiator Springs Racers. 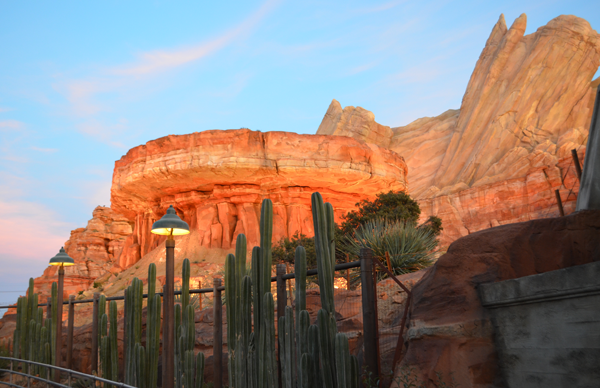 A fantastic ride, but the queue at sunset was even more memorable to me. 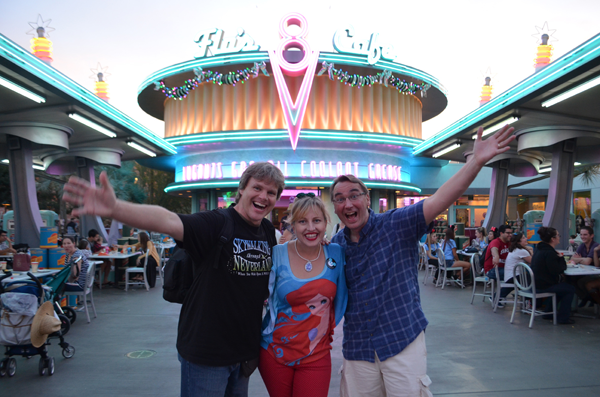 It was time for dinner, and back to Disneyland. 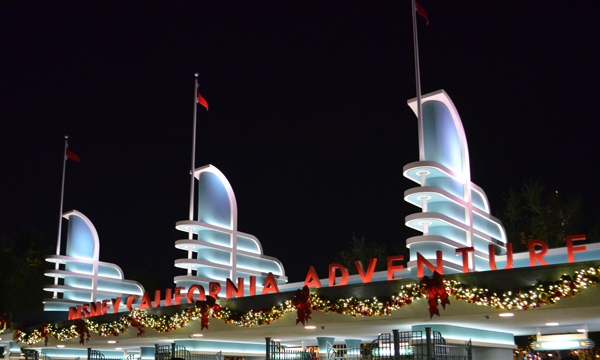 Back past Disney California Adventure’s Christmas tree, through the gates and across the Esplanade to Disneyland to meet up with the rest of our Skywalking group. 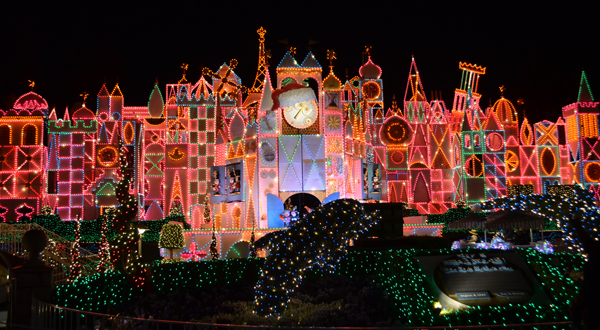 Unfortunately, the evening’s fireworks spectacular was suspended due to winds in the area (I’m need to have to catch that show during Star Wars Half Marathon weekend), but we still had a little time to check out “it’s a small world holiday.” I’ve always loved the exterior of Disneyland’s it’s a small world attraction, with it’s outdoor facade, topiaries and boats floating by, but the area is that much more “magical” during the holidays. 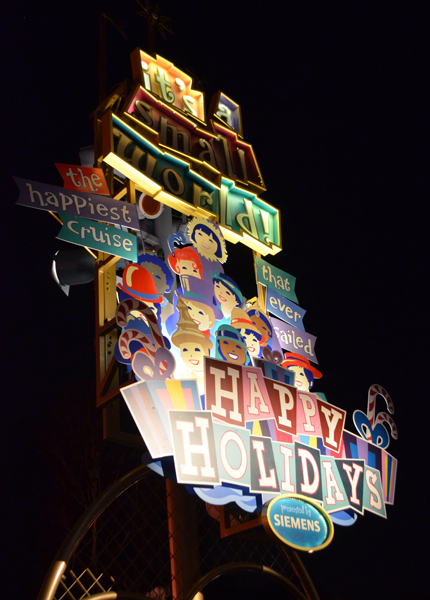 Upon disembarking our small world cruise, our Skywalking Through Disneyland tour had also reached its conclusion. 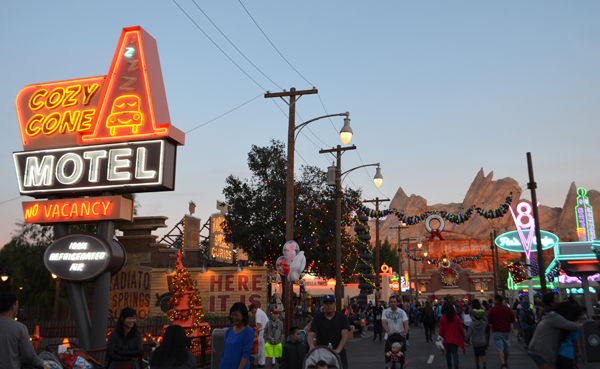 It was time to call it a day and head home. 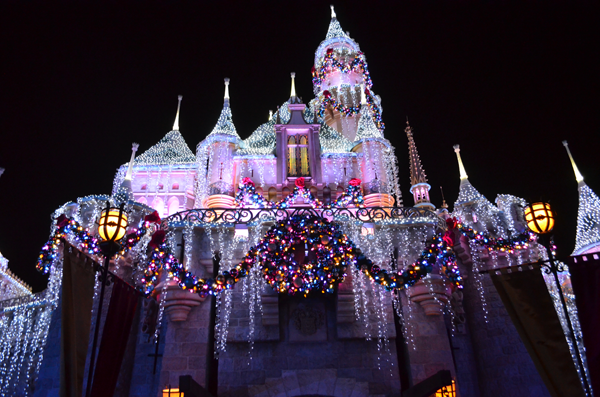 But not without one last parting shot of Sleeping Beauty’s Castle lit up for the occasion. 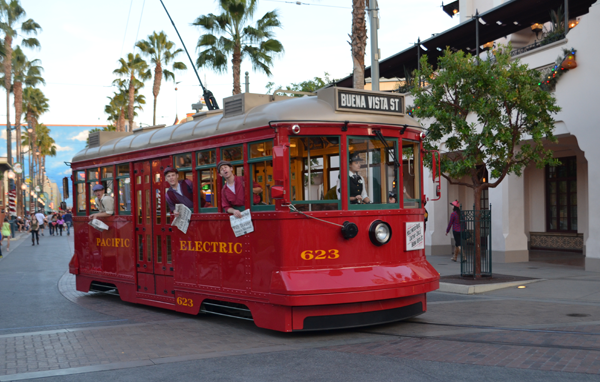 DISCLOSURE: Dave Parfitt was hosted by the Disneyland Resort and received a one-day park hopper ticket for the purposes of experiencing the parks. 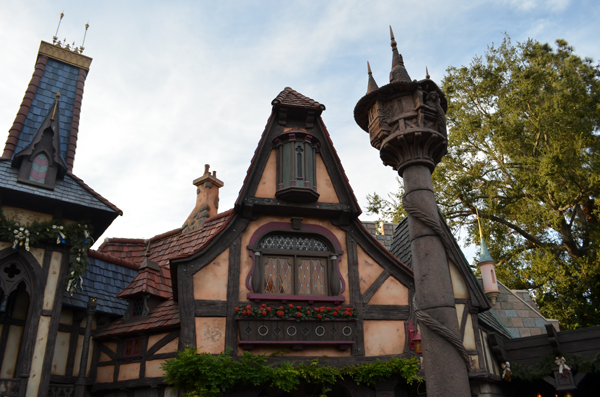 However, all opinions expressed are those of the author. 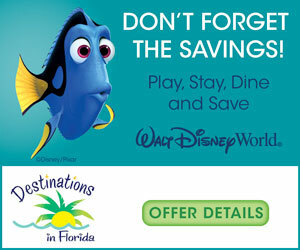 For more family travel news, reviews, and trip reports, be sure to follow Adventures by Daddy on twitter and “like” our facebook page too.